No one could blame you for thinking that the iPhone Twitter client wars had finally calmed down. After all, Twitter apps and the iPhone were a great pair before there was even an official App Store. But developer Tapbots has fired off its own sortie with its newly released Tweetbot. Tweetbot offers the typical handful of basic Twitter features, such as support for uploading media to a variety of services, multiple accounts, saving drafts, sending links to Instapaper and Read Later, viewing conversations, and participating in all manner of Twitter tomfoolery. But as with Apple products, Tweetbot’s appeal is in the details. You can tap and hold on a tweet to access a menu of useful features, like posting a link to it, copying it, e-mailing it, or even translating it. But tap and hold on the avatar of the tweet’s author, and you’ll get a separate menu of key features, such as the ability to add them to a list, send a direct message, follow or unfollow, and report as spam. 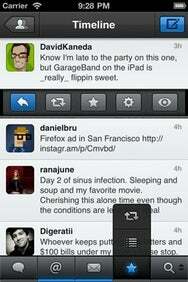 Swipe right on a tweet to quickly display a conversation view, and tap a tweet to display a menu of more options. You can also swipe left to display "related tweets," which is handy for cases like when someone asks a question, and you want to see all the tweets sent in reply to it. In other apps, many of these features typically require bouncing between multiple screens, but in Tweetbot they’re just a tap or swipe away in Tweetbot. The two right buttons on Tweetbot’s toolbar are also somewhat customizable. You can tap and hold to swap them out for different functions, including a list view, a Twitter search tool, and a display of retweets. I helped Tapbots beta test Tweetbot for the last few weeks, and I have to say the developers did a mighty fine job with it. While this is by no means a full Macworld review (that’s on the way), I can tell you that Tweetbot almost instantly became my new default client. You can pick up a copy for your iPhone or iPod touch with iOS 4.1 or later for the low, less-than-a-latte price of $2. Updated at 9:21 a.m. PT to mention the swipe-to-left gesture.